If you are in an organisation that has too many measures and targets, or relies on measures and targets to communicate your strategy and intention, then read on. This will help you diagnose the problem and point to some solutions. Watch the video and you can look at the detail of the slides used in it, below. 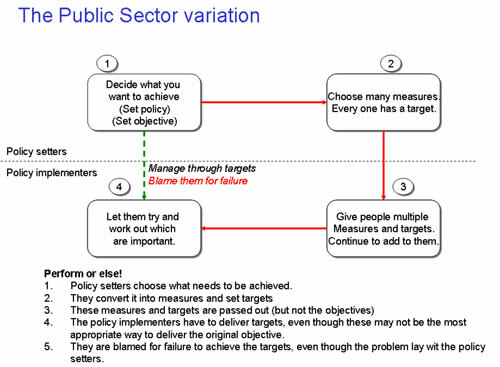 Many organisations pass measures and targets down. Some fail to explain what the measures are for. 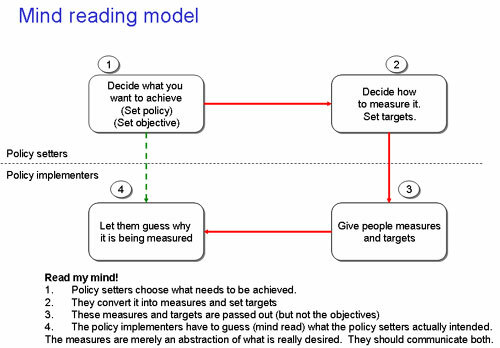 Somewhere, someone has decided that the measure is a useful representation of what they want people to achieve. However, instead of communicating the objective and saying that they believe this measure will best measure it, they simply communicate the measure, as if it is the objective. This means people have to guess or mind-read what the real objective was. This can get worse when the first measure is found unsuitable so others are added. Very soon there are so many measures (and targets) that the people on the receiving end are unclear which are important. Measure madness has developed. In extreme cases, some call this, “Feeding the beast”. The public sector is very good at creating this sort of culture. At the same time the environment and culture you put around performance will also make a difference. In an environment that has created earlier problems and also punishes failure, don’t be surprised when people behave dysfunctionally or distort targets (think of ambulances waiting outside accident & emergency to lower waiting times inside). The focus of attention moves away from “What do we want to achieve” towards “How do we avoid punishment”. Contrast this with a culture where a failure to learn is punished. This is quite different. When teams understand the bigger picture they are able to perform better. Rather than being “micro-managed” they feel they are part of a larger piece. As one client put it, “they have a piece of the strategy in their pocket”. Even if the measures are in conflict, their understanding of the purpose and objectives helps them step over this hurdle and deliver what is needed, because they understand the bigger picture, how they fit in and where they contribute. 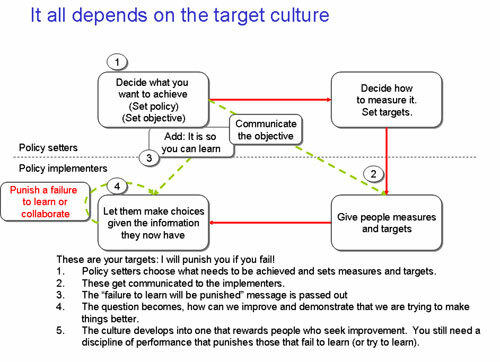 A key difference in the ‘culture of performance’ is that people are reporting measures and targets that are useful to them. They are also using them to improve their part of the organisation. In contrast, “Feeding the beast” demands reports, measures and targets that appear to make little sense. In a performance focused culture, that information has already been used locally to improve performance (and gets reported as well). Implementing any performance management approach is a change management exercise. What levers of change are you using to implement performance management? Are you just measuring performance or are you trying to improve performance? If you have your team and workforce behind you, it makes a dramatic difference. A team engaged with heads and hearts will work together and can make a bigger difference. That is why help you influence the thinking, motivation and attitudes of your staff. We also develop the skills of our clients. A culture of learning encourages people to demonstrate they are improving, whereas, the culture of failure and punishment often encourages dysfunctional behaviour. Of course, you still need the discipline of performance when people persistently fail to learn. But that is a different problem to deal with. We call that, “The discipline of performance”. People have different motives, incentives, knowledge, skills, capabilities, ideas about what they want and where they want to go. They also have different ways of thinking about things. We take advantage of this to achieve some big changes you may have read about, by using the deeper techniques that underlie what we do.